For many years I disliked orange, I don’t know why. Now I like it! It’s such a happy colour. Warm like the sun, full of life. 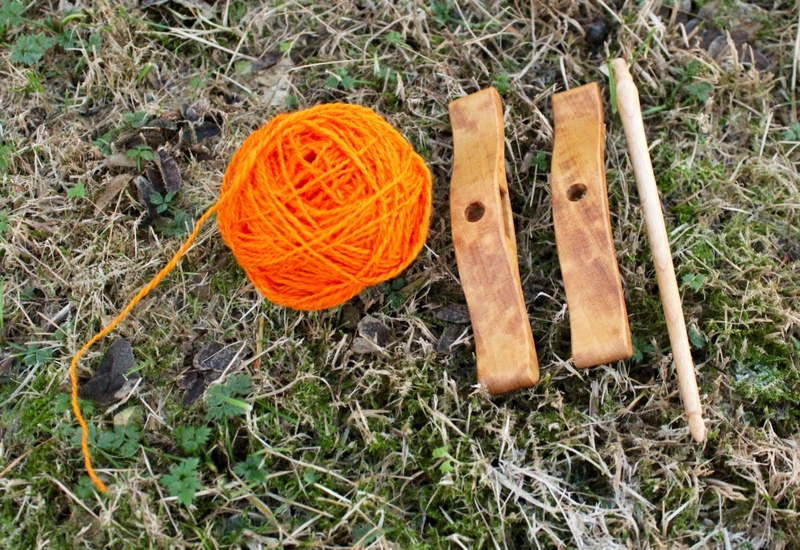 I dyed some Corriedale a couple of years ago, and last week I used my biggest Turkish spindle from IST to spin a yarn for tapestry crochet. 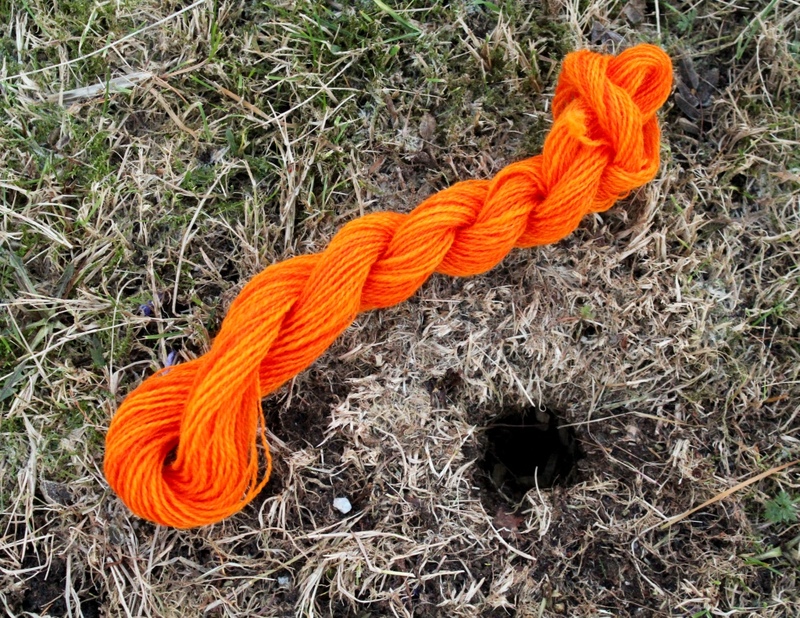 Skein beside water mole hole. I wish all the water moles would move somewhere else and stop undermining our lawn and making it impossible to grow vegetables. Walking on the lawn in the summer is hazardous. We had frost this morning! 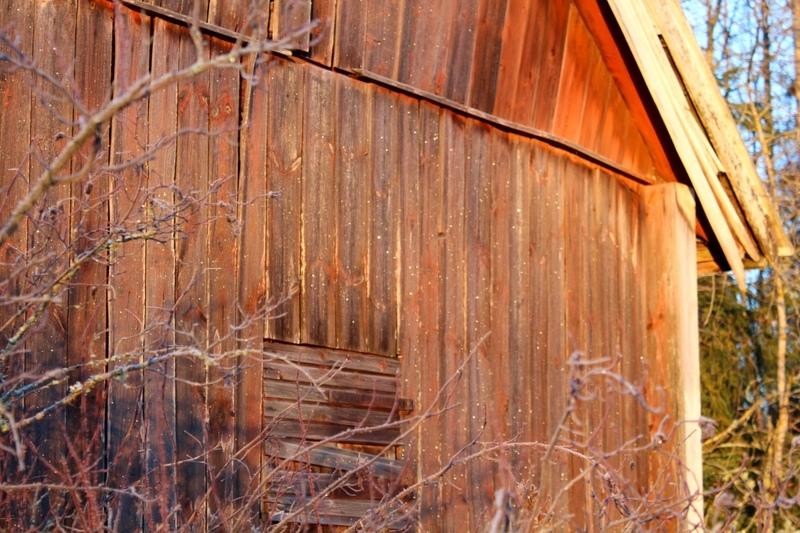 The summer neighbour’s old barn was glittering in the sun. Kasper was bored with me today. I often have the camera with me when we take a walk, and he hates waiting for me. He was so happy when we came home and he saw hubby putting on his walking gear! Now they’re on a long walk in the woods. He’ll be a tired, happy old dog when they come home! I love your blog! My son & daughter-in-law live in Stockholm and I have travelled to visit a number of times. 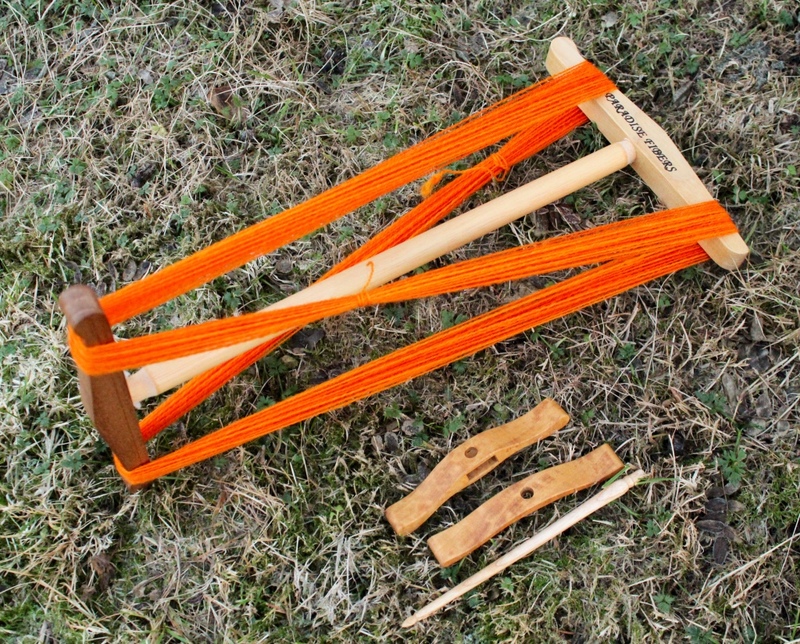 Here in Canada, I am an avid spinner, knitter, and beginning weaver. I am a member of a very active guild as well. 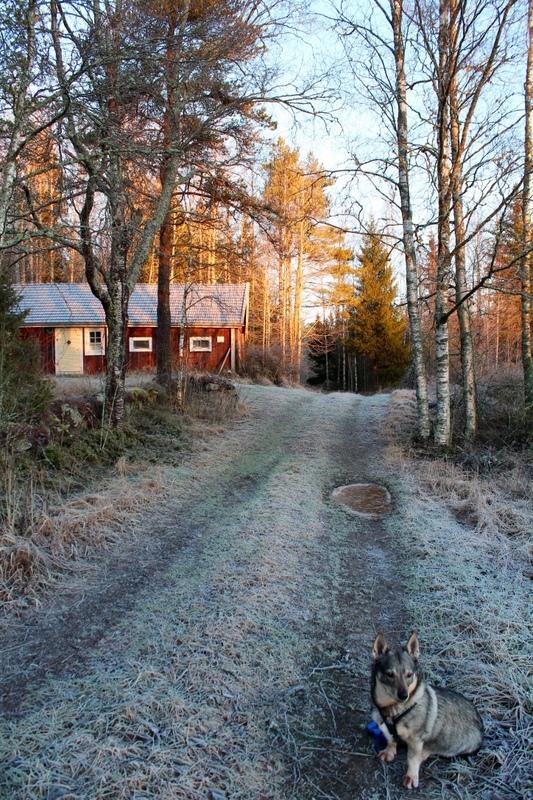 We are coming to Sweden for the Christmas Holidays and I am hoping to find some Swedish fleece to spin. In August when I was visiting, I tried to contact 2 Swedish folks about seeing/buying their fleece. Neither one responded. If you are up to a visit from a zealous Canadian fibrephile then perhaps we could meet???? Hi Judy, and thanks! Please check your e-mail! 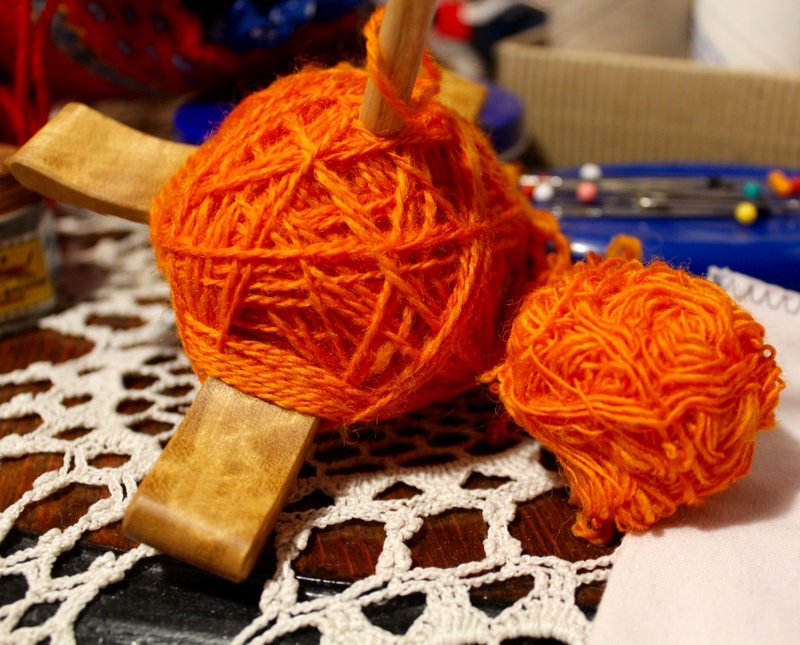 December 16, 2015 - 4:32 pm Marilyn F.
Beautiful orange yarn and nice pictures. Thanks for sharing. I too was not a fan of orange for a long time, but now it is almost at the top of my favorite colors list. And yes, it is a warm color – yellow is good too. Its amazing when you like a color, how often you will see it in different places you visit, or looking through a magazine – and how it blends with the colors surrounding it. Walking with your camera I think puts a person on visual alert, unconsciously finding material to photograph. On our early morning walk today, I spied a tree stump with a very unusual face hanging on a roadside bank that I had not seen before and we walk by it every day. I can see you enjoy your picture taking too. Yes, you look at things differently when you have a camera with you. I find I’m more observant. 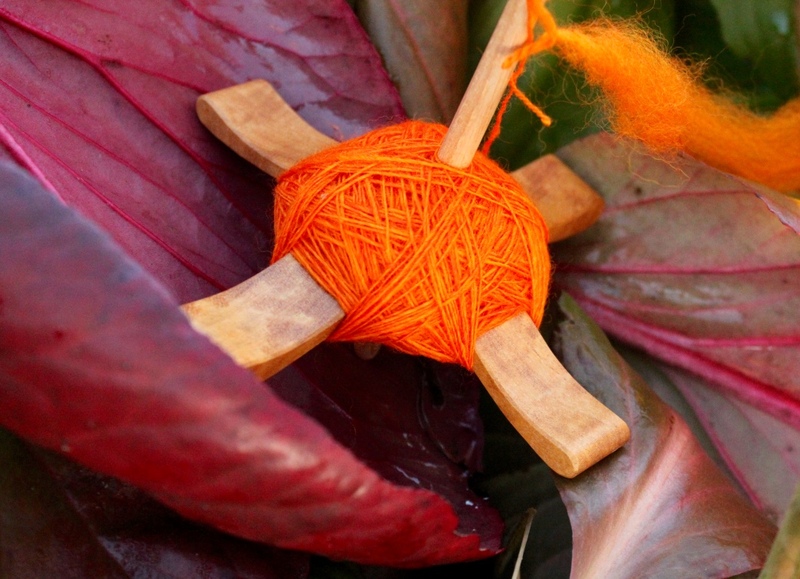 I am catching up, slowly!, on all my blogs and emails………I too love ORANGE 🙂 It is a happy colour and our Fall leaves have so much of that bright colour. Great and nice job.